It has a Perkins Sabre 6 cylinder Turbo Charged Engine, 250HP and 3:1 ratio gearbox. The engine has only done 3000 hours since it was fitted. It has a stainless steel hydraulic tank. The pump is driven off 2 'V' belts on a clutch at the front of the engine. There is a hydraulic winch for an anchor. 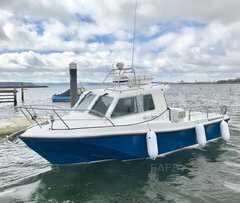 It has 2 VHF Radios, a radar, 12" Garmin plotter with a coloured 'Furino' fish finder, a 2nd plotter for back up, a 16" TV, a radio/CD player and various 240v sockets for heaters etc. Miss Claudia is a Freeward 35' angling and pleasure boat in excellent condition with original gel coat and finished to a very high standard. The engine room comprises of a cold water tank for the kitchen and wc, a deck wash pump, a stainless steel hydraulic pump and 2 separate diesel tanks which hold over 900L together. It also has mains electric which runs 2 heaters over the winter. The deck space is ideal for 10 anglers, complete with rod holders and has a door at the back for landing when skate fishing. 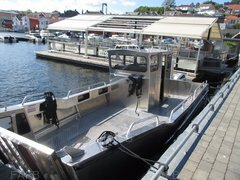 It has deck lights and stainless steel handrail all around the boat. At the bow of the boat, there is a hydraulic winch, galvanised anchor & chain and 300ft of anchor rope. The upper saloon contains a dining table and seating for 6 people. There is a toilet, wash hand basin and shower. The kitchen consists of a sink, gas cooker,/hob/oven, microwave and various cupboards/shelving. The sleeping accommodation sleeps 2 at the bow and also has a double bed in it. There is additional storage space and cupboards. 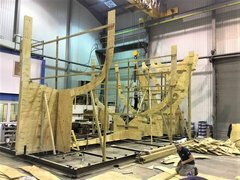 the accommodation is finished in a high quality hardwood. There are 2 lots of 24v batteries (2 in the engine room and 2 in the saloon). There is also 240v shore power that can be plugged in. 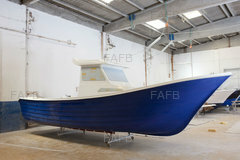 This boat was previously used as a commercial fishing trip boat in Oban with a 10 passenger license.